This is by far the best paper towel on the market. I use it to mop up spills, soak excess oil in snitzel… can’t live without it. We use paper towel in our home for spills and drying fruit or vegetables. We find these are great. Very absorbent. We would buy this brand over most others. When this is on special I buy as many as I can fit in the cupboard. I like that it tears off evenly. The cheaper ones rip everywhere except on the perforated lines. Fabulous for liquid spills on tiles! Handee Ultra paper towels are a strong paper towel l use for wiping up in the kitchen and spills on the floor or bench,very good! 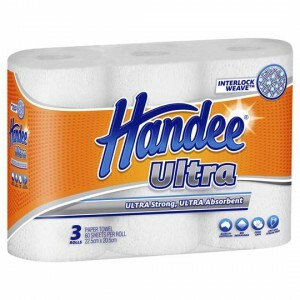 How would you rate Handee Ultra Paper Towel Original White 2ply 180ss?